I hate cleaning make-up brushes. Hate it! It’s one of those tedious but necessary tasks, like doing laundry or making the bed, that I wish would just magically happen on its own. Despite my distaste for the process, I can’t emphasize how important proper brush care is and I am psycho about keeping mine spotless! Brushes are a huge monetary investment. We need many different types and multiples of all of them. It adds up, fast. The only way to protect your investment is to properly care for them. And properly caring for them also means properly caring for your client’s health. Dirty brushes will transfer bacteria from one face to another. This can lead to eye infections, skin irritations, breakouts and other horrible nasty things that I don’t want to even think about. Here is exactly how I keep my make-up brushes clean and happy! When you don’t have time for a thorough washing or don’t have time for brushes to dry before they need to be used again, like for large wedding parties or fashion shows, use 99% alcohol! Keep it in a small spray bottle, give your brush a spray or two and wipe on a papertowel until the colour stops coming off. Alcohol evaporates very quickly, and you’re not stuck with wet brushes that you can’t use immediately. Now they’re safe to use again! Remember to only use 99% alcohol, not rubbing alcohol which is generally 50-70%. Using only 99% alcohol on your brushes will dry them out. Brushes made with natural hairs need moisture or they’ll get brittle, fast. Because the hair in your brush is no longer attached to a hair follicle that is producing natural oils, you need to manually condition it. I clean my brushes with regular shampoo & conditioner. Use warm water to wet the bristles and massage some shampoo into them by swishing them back & forth in the palm of your hand. Be gentle with the bristles, don’t tug or pull on them, and take care to not soak the ferrule and handle. Rinse well, condition and rinse again. Gently squeeze out excess water and reshape the bristles. Synthetic brushes don’t need conditioning. These are generally brushes we use for cream or liquid products. They’re lip brushes, concealer brushes, foundation brushes, etc. For these I actually use dish soap. Lipstick is tough to get out of a brush! Good old Palmolive or whatever dish soap you’ve got in the kitchen cuts through grease, oil & waxy products really well. Never dry your brushes upright! Water will soak into the ferrule and will breakdown the glue inside over time, causing bristles to fall out or the handle to fall off or peel. Always dry your brushes laying flat on a towel or paper towel, or even better is to position them with the bristles hanging over the edge of a table or counter. · BRUSHES NEED TO BE SANITIZED AFTER EVERY PERSON! Never use a dirty brush on someone! Ew. · Keep disposable tools (sponges, lip/eye/mascara wands, q-tips, etc.) always on hand for use on clients with open wounds, cold sores and eye infections. Avoid using your brushes in these cases. · Don’t forget all your non-brush tools! This includes eyelash curlers, scissors, tweezers, spatulas, palettes, brow & lash combs, and more. Spray them with 99% alochol to keep them sterile. · Never reuse disposable items on clients and always machine or hand wash reusable fabric make-up puffs or blenders! · Always keep clean and dirty brushes separate when working, so that they don’t come into contact with each other and you don’t accidently grab a dirty brush. Have a designated dirty brush cup so there is never confusion! · Invest in a good brush roll or brush tube to keep your brushes safe during travel. Storing brushes loose in a bag can destroy their shape. I use MUFE brush tubes, it doubles as a brush cup when working. · For those of you who aren’t make-up artists, but are make-up junkies…you need to clean your brushes too! I clean my personal brushes every two weeks or so. They’re only touching my face, so they don’t need cleaning after every use. Make this more frequent if you’re prone to acne, break outs or any sort of skin irritations. 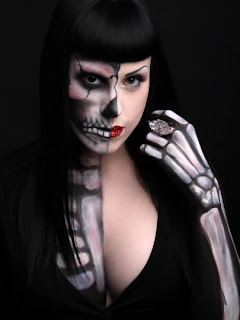 Horror and beauty loving, vampire reading, vegan, film/tv/celebrity make-up artist based out of Toronto Ontario. Hollywood North baby! Visit me often for tips, tricks, product reviews and a look inside the life of a make-up artist working in the film industry. All with a hint of...strange.